No 8 is a very narrow building squeezed in between two much wider ones. In 1772 a survey of every house in the city was taken in consequence of the Mileways Act of 1771. According to Salter, No. 8 was then in the occupation of a Mr Slatter, and its frontage measured just 4 yards 0 feet 7 inches. This building was in the parish of All Saints until that church was deconsecrated in 1971. At the time of the 1851 census, Esther Furley, the widow of the poulterer who used to have this shop, lived upstairs with two servants. In 1861 the house upstairs was occupied by the architect Charles Buckler and his wife in 1861. No one was living there in 1871. 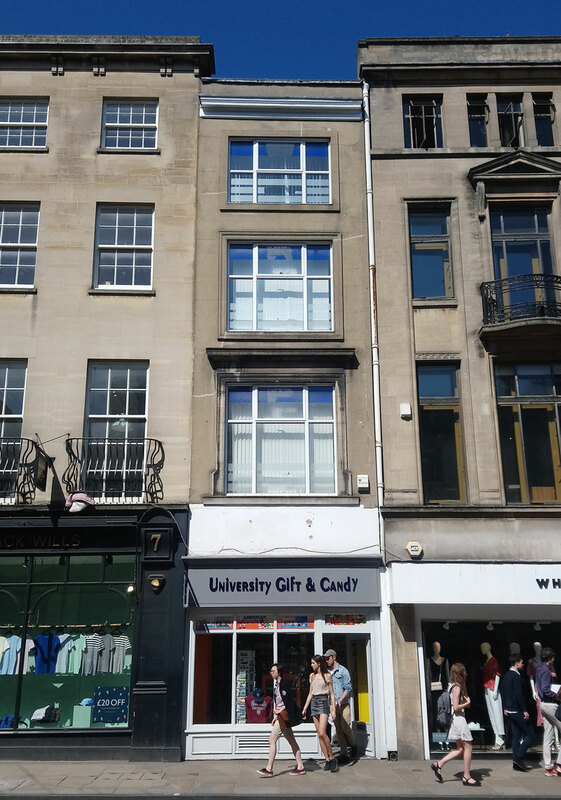 In 1881, the surveyor and auctioneer John B. Hobdell (one of the partners in the ground-floor premises) lived upstairs with his 15-year-old schoolboy son. In 1901 Stephen King, who sold china and glass, lived over his shop with his wife and baby son. In 1911 he was still here in the five rooms over his shop with his wife and two children, plus a servant.